Spread the love this February with ten new releases from the world of Arrow! Dive head first into the month with three new releases from Arrow Academy beginning with legendary French filmmaker Henri-Georges Clouzot. In 1964, backed with an unlimited budget from Columbia Pictures, Clouzot set out to film L'Enfer. From the start the production was beset from a number of severe problems. Ultimately the film was never finished, but in 2009 directors Serge Bromberg and Ruxandra Medrea pieced together what footage there was and detailed the film's problematic journey in the semi-documentary Henri-Georges Clouzot's Inferno. Shift gears from semi-documentary to pseudo-documentary with Federico Fellini's made-for-Italian-TV film, Orchestra Rehearsal. This satirical look at politics has a bickering orchestra in the role of a governing body. Like many of Fellini's films, Orchestra Rehearsal is just as relevant today as it was upon its initial release. The film is presented with a brand-new 2K restoration from the original film elements. For a deeper look at politics there's the pairing of director Jean-Luc Godard and filmic critic Jean-Pierre Gorin. The duo worked together to shake up cinema all while exposing political ideas. This stretch of filmmaking has come to be known as Godard's "radical years." Arrow Academy has collected five films that Godard and Gorin released together in one boxset - Jean-Luc Godard + Jean-Pierre Gorin: Five Films, 1968-1971. Not to be outdone, Arrow Video has seven releases of their own starting with the Godfather of Gore, Herschell Gordon Lewis and his late 60's entry, The Gruesome Twosome. The work of Lewis isn't for everyone, but fans of the Godfather's macabre madness will surely appreciate this high definition presentation. Included as a nice little bonus is Lewis' foray into the world of vampires with A Taste of Blood. 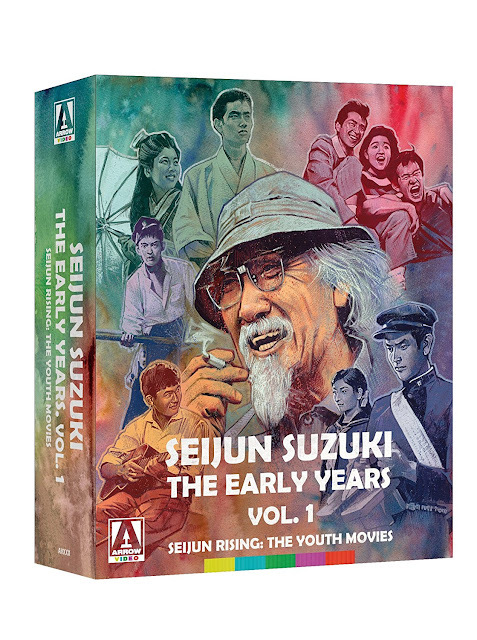 From the Godfather to Diamond Guys, Arrow Video will release Seijun Suzuki: The Early Years Vol 1. This boxset features five films from the B-movie maverick with a focus on youth. Fans of Suzuki's later work will certainly get a kick out of watching his career evolve of the course of these earlier films. Arrow Video will also be releasing the splatter classic Re-Animator. Adapted from a short story from fame horror author H.P. Lovecraft, this 80's film was responsible for making Stuart Gordon, Jeffrey Combs and Barbara Crampton horror legends. 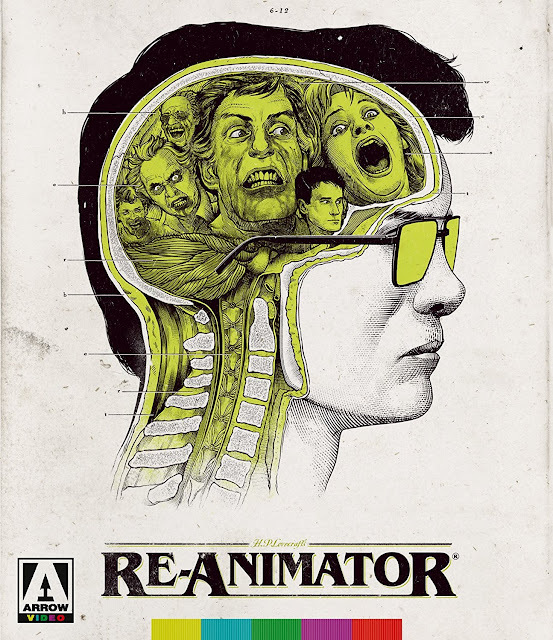 Re-Animator is presented in an unrated 4K restoration and is loaded with special features. Keeping the icons coming, Arrow Video will release two films from the maestro Dario Argento - The Cat O' Nine Tails and The Bird with the Crystal Plumage. The later film reinvented the 'giallo' and put Argento on the map. The former proved he was here to stay. Both films are presented with brand-new 4K restorations. 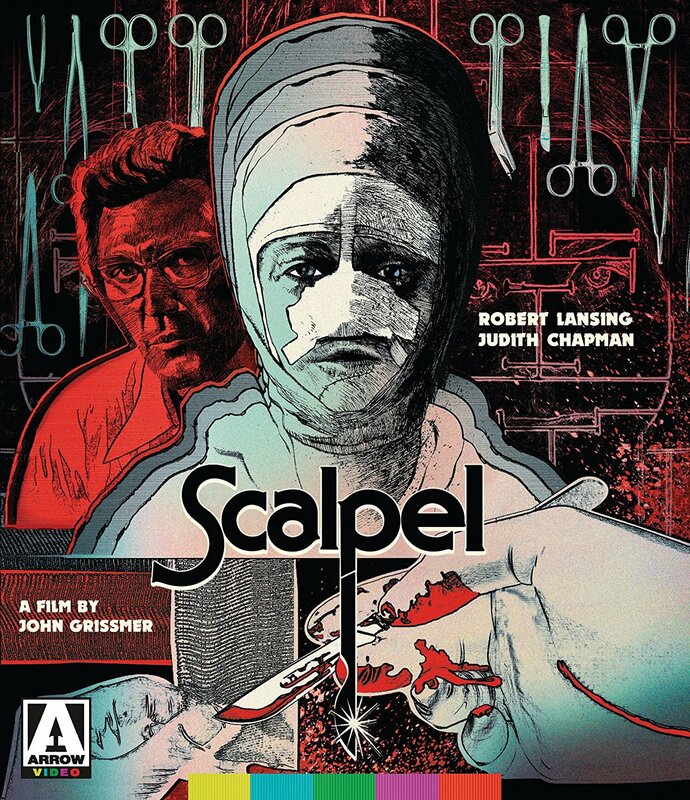 Next up is Scalpel, a grisly film about a surgeon that isn't afraid of malpractice. Original known as False Face, Scalpel was the first film to be directed by future Blood Rage director John Grissmer, Robert Lansing stars as the doctor while daytime soap paragon Judith Chapman plays the deranged doctor's "patient." Bringing February to a close is Basket Case, the often intimated but never duplicated film about conjoined twins from the twisted mind of Frank Henenlotter. This film will still give you the creeps, but no, your mind is not playing tricks on you, Basketcase does come with a brand-new 4K restoration courtesy of the Museum of Modern Art. 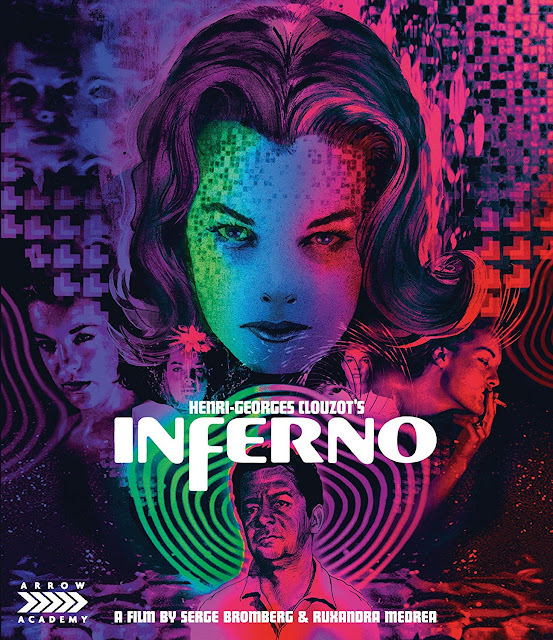 Set in a beautiful lakeside resort in the Auvergne region of France, L'Enfer (Inferno) was to be a sun scorched elucidation on the dark depths of jealousy starring Romy Schneider as the harassed wife of a controlling hotel manager (Serge Reggiani). However, despite huge expectations, major studio backing and an unlimited budget, after three weeks the production collapsed under the weight of arguments, technical complications and illness. In this compelling, award-winning documentary Serge Bromberg and Ruxandra Medrea present Inferno's incredible expressionistic original rushes, screen tests, and on-location footage, whilst also reconstructing Clouzot's original vision, and shedding light on the ill-fated endeavor through interviews, dramatizations of un-filmed scenes, and Clouzot's own notes. OH, YES... OUR WIGS ARE MADE FROM GENUINE HUMAN HAIR... AND HOW! After dabbling in the unlikely world of children's entertainment with the likes of Jimmy, the Boy Wonder and The Magic Land of Mother Goose, in 1967 "Godfather of Gore" Herschell Gordon Lewis returned to genre he helped create with the delightfully depraved The Gruesome Twosome! The young women of a small-town American college have more than just split-ends to worry about... Down at the Little Wig Shop, the batty Mrs. Pringle and her socially-inept son Rodney are procuring only the finest heads of hair - by scalping the local co-eds! Can they be stopped before they clear the entire campus of luxuriant-haired ladies? Also including HG Lewis' Dracula-inspired vampire epic A Taste of Blood as a bonus feature, this is one Gruesome Twosome that's well worth flipping your wig over! 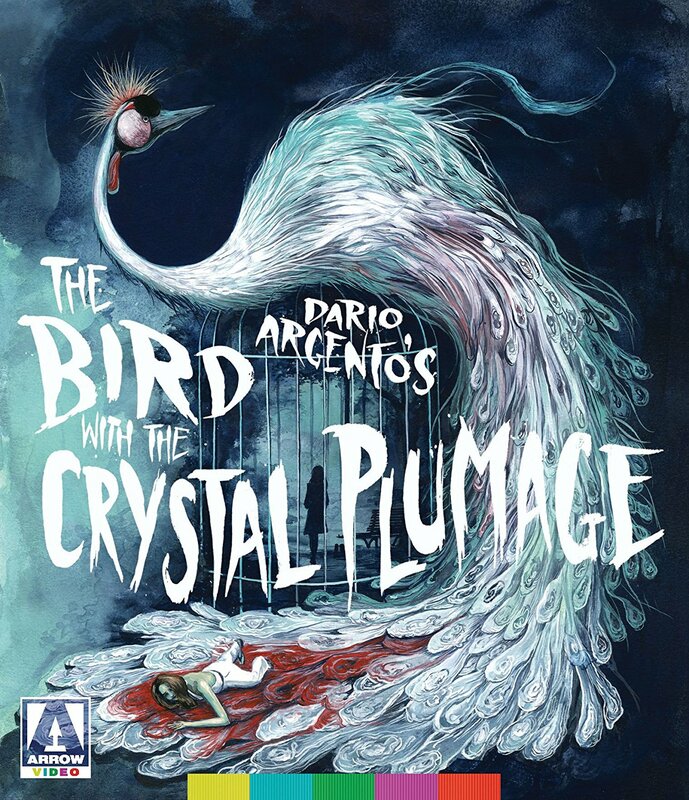 Following the success of his debut feature, The Bird with the Crystal Plumage, distributor Titanus tasked writer/director Dario Argento with delivering a follow-up in short order. The resulting film, granted a greatly enhanced budget and heralded in its US marketing campaign as "nine times more suspenseful" than its predecessor, was The Cat O' Nine Tails. When a break-in occurs at a secretive genetics institute, blind puzzle-maker Franco ArnÃ² (Karl Malden, Patton, One-Eyed Jacks), who overheard an attempt to blackmail one of the institute's scientists shortly before the robbery, teams up with intrepid reporter Carlo Giordani (James Franciscus, Beneath the Planet of the Apes) to crack the case. But before long the bodies begin to pile up and the two amateur sleuths find their own lives imperilled in their search for the truth. And worse still, Lori (Cinzia De Carolis, Cannibal Apocalypse), Franco's young niece, may also be in the killer's sights. This second entry in the so-called "Animal Trilogy" found Argento further refining his distinctive style and cementing his reputation as the master of the giallo thriller. Co-starring Catherine Spaak (Il Sorpasso) and Rada Rassimov (Baron Blood), and featuring another nerve-jangling score by the great Ennio Morricone (The Bird with the Crystal Plumage, The Good, The Bad and the Ugly), The Cat O' Nine Tails remains one of Argento's most suspenseful and underrated films. 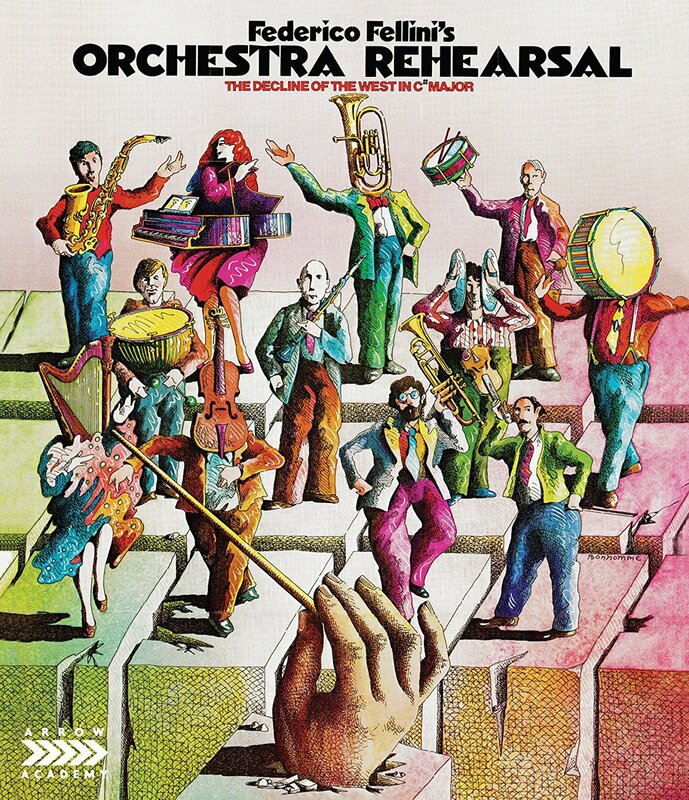 Made in 1978 for Italian television, Orchestra Rehearsal is possibly Fellini's most satirical and overtly political film. An allegorical pseudo-documentary, the film depicts an Italian television crew's visit to a dilapidated auditorium (a converted 13th-century church) to meet an orchestra assembling to rehearse under the instruction of a tyrannical conductor. The TV crew interviews the various musicians who each speak lovingly about their chosen instruments. However, as petty squabbles break out amid the different factions of the ensemble, and the conductor berates his musicians, the meeting descends into anarchy and vandalism. A destructive crescendo ensues before the musicians regroup and play together once more in perfect harmony. Abounding with its director's trademark rich imagery and expressive style, Orchestra Rehearsal marks the last collaboration between Fellini and the legendary composer Nino Rota (due to the latter's death in 1979) who provides one of his most beautiful themes in the film's conclusion. The Boy Who Came Back (1958) marks the first appearances of "Nikkatsu Diamond Guys" and regular Suzuki collaborators Akira Kobayashi and Jo Shishido, with Kobayashi cast as the hot-headed hoodlum fresh out of reform school who struggles to make a clean break with his tearaway past. The Wind-of-Youth Group Crosses the Mountain Pass (1961) is a carnivalesque tale of a young student who hooks up with a down-at-heels travelling circus troupe. Teenage Yakuza (1962) stars Tamio Kawaji as the high-school vigilante protecting his community from the extortions of mobsters from a neighboring city. The Incorrigible (1963) and Born Under Crossed Stars (1965), both based on Toko Kon's novels about young love, represent Suzuki's first films set in the 1920s era later celebrated in his critically-regarded Taisho Trilogy. HERBERT WEST HAS A GOOD HEAD ON HIS SHOULDERS... AND ANOTHER ONE ON HIS DESK. When medical student Dean Cain advertises for a roommate, he soon finds one in the form of Dr. Herbert West. Initially a little eccentric, it some becomes clear that West entertains some seriously outlandish theories specifically, the possibility of re-animating the dead. It's not long before Dean finds himself under West's influence, and embroiled in a serious of ghoulish experiments which threaten to go wildly out of control. Dario Argento (Deep Red, Suspiria) made his indelible mark on Italian cinema with The Bird with the Crystal Plumage - a film which redefined the 'giallo' genre of murder-mystery thrillers and catapulted him to international stardom. A staggeringly assured debut, The Bird with the Crystal Plumage establishes the key traits that would define Argento's filmography, including lavish visuals and a flare for wildly inventive, brutal scenes of violence. With sumptuous cinematography by Vittorio Storaro (Apocalypse Now) and a seductive score by legendary composer Ennio Morricone (Once Upon a Time in the West), this landmark film has never looked or sounded better in this new, 4K-restored edition from Arrow Video! HE LOST THE FACE OF THE WOMAN HE LOVED... SO HE GAVE IT TO SOMEONE ELSE. In Scalpel, Lansing plays Dr. Phillip Reynolds, a man whose daughter Heather (Judith Chapman, As the World Turns, General Hospital) has run away from home a year prior following the suspicious death of her boyfriend. When he happens across a young woman one night, her face beaten beyond recognition, the unhinged Reynolds sees his an opportunity to put his trusty scalpel to use - hatching a plan to "reconstruct" her face in the image of his missing daughter, and so claim her sizeable inheritance. Photographed by celebrated cinematographer Edward Lachman, who would go on to serve as DP on the likes of Erin Brockovich and The Virgin Suicides, Scalpel is an exemplary slice of Southern-fried gothic, finally rescued from VHS obscurity in this revelatory new Blu-ray edition from Arrow Video.